Ladakh pose a unique place for its exquisite craftsmanship. The handicraft of Leh- Ladakh projects the unique art and cultural heritage of the region. Most Art and Crafts in Leh-Ladakh serve the need of the local people. For many it’s the main source of earning livelihood. In the yesteryears, most lavish articles were acquired through imports. Even today, most of the antique shops in Leh town are either owned by Kashmiris or Tibetans. But if you are a true lover of art and originality, head on to the village of Chilling. The village situated nearly 19 kms up the river of Zanskar from Nima is an exception in Ladakhi handicraft. This village consists of a society of metal workers, who are considered to be the offspring of artists from Nepal. These artists from Nepal came here in the middle of 17th century to build a colossal idol of Buddha at Shey. Since then, the descendants are carrying on their hereditary trade. These artisans produce an array of beautiful articles for religious and domestic purpose by using copper, silver and brass. So, you will find tea as well as chang pots (chapskyan), hookkah-bases, teacup stands, ladles and bowls here, to mention a few. Occasionally, you may also find some silver chorten (stupa). These are generally made for installation in domestic shrines and temples. However, the artifacts from chilling are quite heavy on ones pocket, therefore, most of the local people prefer to use the bowls, cooking pots and agricultural implements made by local blacksmiths (better known as gara). One can see the best of metal and wood work in the wealthier Ladakhi homes’ kitchens. They proudly display big and ornate iron stoves decorated using precious stones made by the deft hands of gara. Exquisite wood work can be witnessed in the form of beautifully carved large wooden shelf, low curved tables in Ladakhi living-rooms. The artistic skills of local artisans are also projected on the wooden beams or pillars in monasteries and even in some hotels. Actually, craftsmanship in this region has not gone beyond producing items of daily use. Some other signature style crafts of Leh-Ladakh are Pattu and Baskets. Pattu is a warm and rough woolen fabric. Baskets are woven of willow twigs or particular kind of grass. They are used for carrying fresh vegetables, manure to the fields or even babies. Besides, Thangka painting, traditional tie-dyed woolen shoes with leather sole, pashmina shawls, carpets, hand woven woolen clothes and hand prayer wheel. Most of these aforesaid items can be obtained either on demand or you can buy it from the District Handicrafts Centre, Leh. 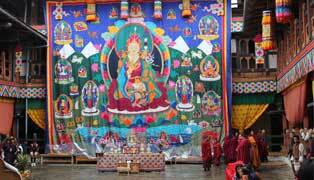 There you can also find some special items like Thangka painting and Pashmina shawls. The Thangka paintings made according to firm rules passed along from generation to generation are a rare visual treat.